Open from April to October, the Signal de Bougy is one of Switzerland’s biggest tree-top parks! The idea: to swing through the trees like a monkey up to 22 m from the ground, in complete safety! Come with your family or friends and have fun while soaking up the stunning view over Lake Geneva and the Alps. The Signal de Bougy forest grounds cover 25,000 square metres. The Adventure Park offers 15 different itineraries, 4 of which are for children from 4 years up. On these itineraries of increasing difficulty several metres above ground, visitors pass from tree to tree or walk on swaying footbridges or walk on a taut rope to end up on a rope bridge. Guaranteed to boost adrenalin levels! Practicing this spectacular leisure activity is safe. Adventurers are equipped with a harness and receive adequate training and useful advice before considering themselves as squirrels. 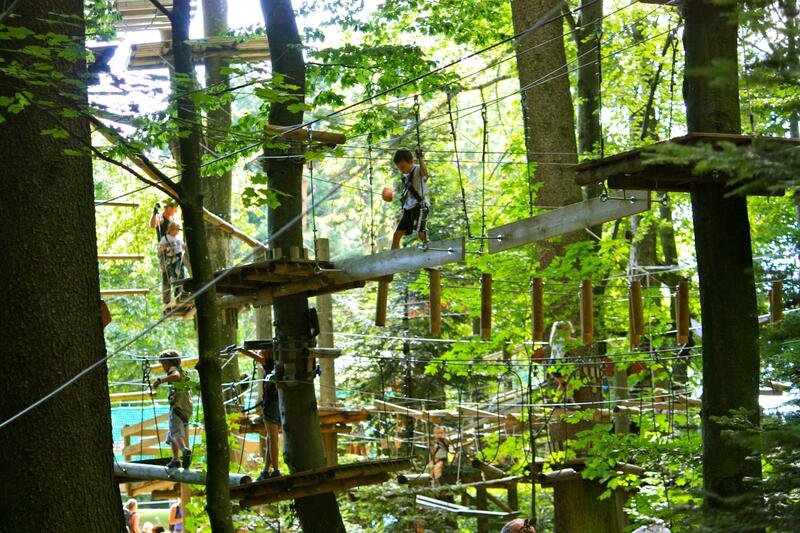 This Adventure Park is a leisure concept in the Signal de Bougy forest for children and confirmed adventurers.